Round Robin, a blog from the Cornell Lab of Ornithology, posted a great report about the effects of Hurricane Ike on birding spots along the upper Texas coast. Click here for an excellent map, many details as well as links for updates from other sources. From American Bird Conservancy: On Sept. 17, Senators Ben Cardin (D-MD), George Voinovich (R-OH), Susan Collins (R-ME), Patrick Leahy (D-VT), Joseph Lieberman (I-CT), Robert Menendez (D-NJ) and Sheldon Whitehouse (D-RI) introduced Senate bill S. 3490 to increase funds for the Neotropical Migratory Bird Conservation Act. Representatives Ron Kind (D-WI) and Wayne Gilchrest (R-MD) introduced a similar bill, H.R. 5756, in the House of Representatives. Want to contact your political representatives? Here are the senators, and here are the representatives. From Cornell Lab of Ornithology: "Little Green Places" contest deadline is Oct. 31. The "Celebrate Urban Birds" program invites birders to send photos, drawings or links to videos that show small urban spaces that provide shelter, food or water. You can send your Littel Green Place to urbanbirds AT cornell DOT edu. Many details appear here. A new study has found that federal and state funding to conserve and recover Hawaiian birds species listed under the Endangered Species Act is much lower than for mainland birds, and is insufficient to recover the many declining bird species on the islands. The study found that on average, endangered bird species on the mainland received 15 times more funding than endangered Hawaiian birds. 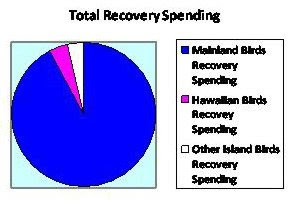 Of the total spent toward recovery of listed bird species between 1996-2004, the 31 birds unique to Hawaii received only 4.1% of the recovery funds available from all sources, which included the U.S. 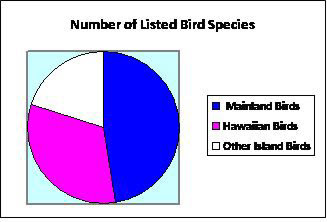 Fish and Wildlife Service, other federal sources, and the state, even though nearly one third of all U.S. endangered birds are found exclusively on Hawaii. Nearly one-third of all U.S. endangered birds live on the Hawaiian islands?! Do mainland birders support the conservation of Hawaiian species? Are they talking to the agencies and individuals who control recovery funds? Or is this a long-term case of "out of sight, out of mind"? It's Thursday, and it's been two weeks since the last birding carnival, so it must be time for I and the Bird #84. Rob Fergus of The Birdchaser crafted A Beginner's Guide to Bird Blogs and offered tips for starting a blog. Enjoy! DALLAS (AP) -- An official with the U.S. Fish and Wildlife Service said Tuesday the tidal surge from Hurricane Ike has left a "sheen" of oil on a southeast Texas wildlife refuge, potentially endangering rare species of birds and other animals. 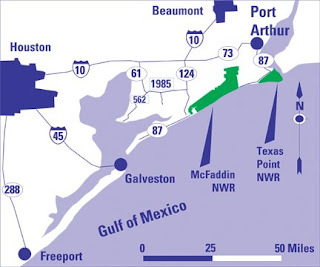 The U.S. Geological Survey posted pre-Ike and post-Ike photographs of Bolivar Peninsula. What an incredible scouring the land endured. Various national wildlife refuges in southwest Louisiana have been closed due to Ike damage. These include Sabine, Lacassine, Cameron Prairie and Shell Keys refuges. Updates about their status should be available from Southwest Louisiana National Wildlife Refuge Complex Office at 337-598-2216. Are you a mad birder? 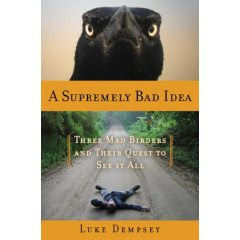 Luke Dempsey's book, "A Supremly Bad Idea: Three Mad Birders and Their Quest to See it All," immediately made me laugh. When WildBird's book reviewer, Jessie Barry, requested the copy so she could evaluate it, I almost cried ("No, I wanna keep it!"). Barry's review appears on page 64 of the September/October issue. Dempsey recently appeared online in an interview, which I enjoyed reading. He sounds like a fun fellow, no? With the offical workweek over, maybe you have more time now to enjoy the most recent edition of the biweekly birding carnival. You'll find I and the Bird #83 at Wrenaissance Reflections. Her invocation of Three Dog Night at the beginning of the carnival set a wonderful tone and brought back some childhood memories of road trips to the desert. You'll find joy in the world by visiting the carnival and reading some, if not all, of the 40+ links. While the 16 winning bird photographs appear on pages 42 to 53 of the September/October issue, they also appear online at WildBirdmagazine.com. You'll find them here. 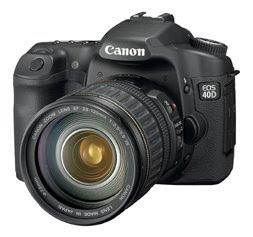 This year's grand prize was a Canon EOS 40D. Don't you want to see who won it? Feel free to leave a comment on this post, saying which bird photo(s) you like best! You'll find details about the 2009 photo contest in the March/April and May/June issues. Start shooting now!